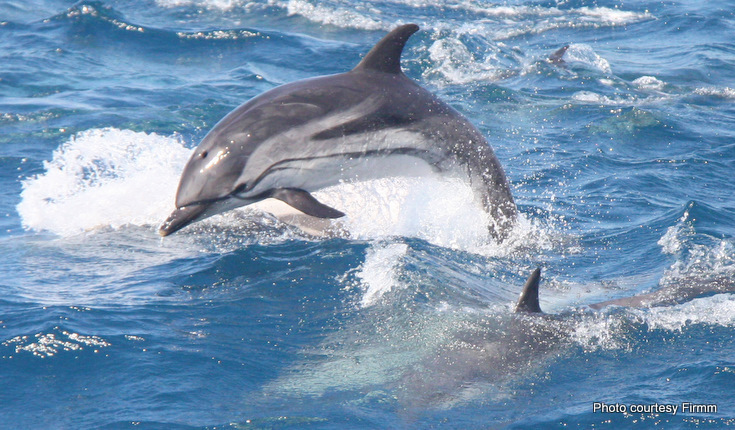 The Strait of Gibraltar is well known for its whale and dolphin populations. 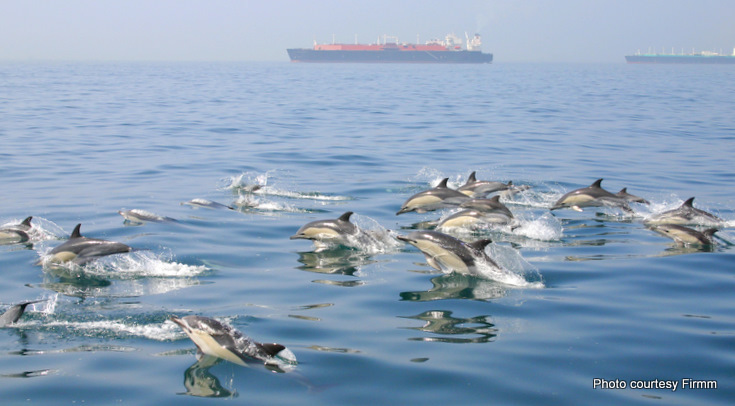 Common dolphins, striped dolphins, bottlenose dolphins and pilot whales are year round residents, sperm whales are seen between April and August and orcas (killer) whales in July and August; fin whales too can be spotted on transit between the Atlantic and Mediterranean. The rich supply of food, generated from the nutrients thrown up by the currents that form in this narrow passage between Spain and Morocco is the reason these whales and dolphins congregate here. But it’s a busy place with 300 ships a day passing through the Strait not to mention the numerous fishing boats likewise taking advantage of the abundance of fish. Firmm (Foundation for Information and Research on Marine Mammals) was set up in 1997 by Swiss designer Katharina Heyer. Already a successful business women, a meeting with whale and dolphin preservationists while on holiday in Tarifa in southern Spain led her to completely change the direction of her life. We needed to know more, she realized, about the populations of whales and dolphins in the Strait of Gibraltar, how they were affected by shipping, noise pollution ….. From the beginning her premise has been that through education people can come to understand and care for these special creatures and an important aspect of the foundation’s work is in giving talks and providing opportunities for respectful whale and dolphin watching. 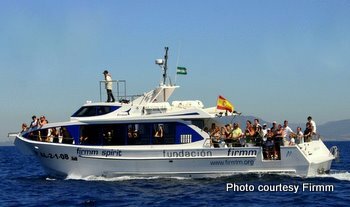 From April to October you can join the researchers on 2 hour excursions out of Tarifa where the foundation has an office. There’s a half hour introduction beforehand so you can make the most of your trip. Over the years the biologists and boat crew have become expert in anticipating where the whales and dolphins are likely to be seen in different conditions and they have an over 98% success rate in sightings on their trips. What comes across reading accounts of the tours is the sensitive way the animals are approached and given space – are respected. If you want to get more involved and spend longer on the water in the company of these gentle mammals, the foundation also offer week long Whale Watching Courses suitable for adults and children. Weather permitting, there will be one or two excursions each day, presentations by biologists and time to enjoy Tarifa and the surroundings. Sitting between the Mediterranean and the Atlantic Tarifa is known for being windy, it makes for good surfing conditions, but might prohibit whale watching some days – if that’s the case other activities are planned, trips to sand dunes or a walk through a cork-oak forest to a waterfall, for example. Local accommodation can be booked through firmm with hotel or self catering options. We learnt of Firmm at ITB Berlin where we met with Nina Cziczek who told us of their work. Or to enquire about whale watching trips ring firmm 2 or 3 days in advance at our office in Tarifa + +34 956 62 70 08. Trips operate from April to October.